We participated in two tracks: Knowledge Base Acceleration (KBA) Track and Session Track. In the KBA track, we focused on experi- menting with different approaches as it is the first time the track is launched. We experimented with supervised and unsupervised re- trieval models. Our supervised approach models include language models and a string-learning system. Our unsupervised approaches include using: 1)DBpedia labels and 2) Google-Cross-Lingual Dic- tionary (GCLD). While the approach that uses GCLD targets the central and relvant bins, all the rest target the central bin. The GCLD and the string-learning system have outperformed the oth- ers in their respective targeted bins. The goal of the Session track submission is to evaluate whether and how a logic framework for representing user interactions with an IR system can be used for improving the approximation of the relevant term distribution that another system that is supposed to have access to the session infor- mation will then calculate. the documents in the stream corpora. Three out of the seven runs used a Hadoop cluster provide by Sara.nl to process the stream cor- pora. The other 4 runs used a federated access to the same corpora distributed among 7 workstations. Araújo, S, Boscarino, C, Gebremeskel, G.G, He, J, & de Vries, A.P. (2013). CWI at TREC 2012, KBA track and Session Track. In E.M Voorhees & L P. Buckland (Eds. 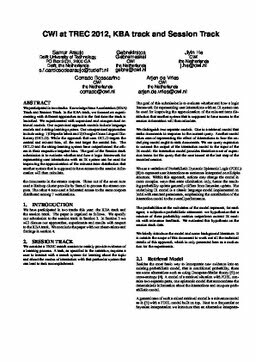 ), NIST Special Publication 500-298: The Twenty-First Text REtrieval Conference Proceedings (TREC 2012). NIST.